Everything you've read up to now was learned by me as I was writing this. I didn't start this with any of the information in here. I was surprised at how counter-intuitive each step ended up being—I can totally see why there are so many blog posts describing how to set it up. As I've revised this for changes in Webpack and other tools, it hasn't gotten better. The process of maintaining this minimal setup is an exercise in rote memorization, because nothing makes any intuitive sense. The behavior of these tools is opaque and unpredictable, with failure modes that rarely give any indication of the real problem. Nevertheless, we got it all working and the amount of configuration wasn't that bad in the end. Still, each step felt like a battle, because despite being part of the Webpack ecosystem for the most part, the tools and modules just don't seem to work well together. That said I don't want to just complain. I do want to outline what I think are the two ways these tools could be designed. In my view, developer tools must be designed around interoperability and developer ergonimics. Two pieces of software interoperate when they can work together to solve a larger problem that neither can solve on their own. We saw this time and time again in our journey. We saw that Jest provided a library to write tests, but lacked the ability to load and execute our code. Webpack can package our code so it can be tested, but it just doesn't interoperate without an up-to-date plugin exists, and that is usually not the case. The interoperability between all these parts is also totally opaque. This means that you have no way to know how the tools are working or even observe them working together without debugging into the source code. As a tool developer, the situation is difficult, because everything is very custom. In Webpack's case, each type of integration is different. To write your own loader, you implement a nebulous interface. Writing a plugin is highly complex. As a plugin or tool developer, no lessons learned working with one tool can be applied to another. Worse, though, is for users of these tools. Because the behavior of these tools is totally opaque, and any extension points must be explicitly provided by the tool creator, it's difficult to figure out how to use them solve the problem in front of you. Most people resort to just being told the answer, because figuring it out is difficult. To make matters more confusing, tools often provide built-in functions for some common things, but not others. In Webpack, we can configure source maps without a plugin, we can configure minification with a built-in plugin, but we cannot process CSS without a manually-installed loader. These tools all seem to be confused about their scope. Are they small, single-purpose tools, or monolithic integrated systems? They are almost all hybrids. They attempt to be extensible, but in opaque, inconsistent, or undocumented ways, while also being monolithic, but with terrible developer erogonomics. Ergonomics is “an applied science concerned with designing and arranging things people use so that the people and things interact most efficiently and safely”. Ruby on Rails has great efficiency for getting started: rails new my_blog, and you have a website. Tachyons, which we saw earlier, has great efficiency when working with it—each class it provides is dead simple and obvious in its behavior, with no interdependencies. RSpec is an example of a tool with amazing ergonomics around upkeep. They created major breaking changes going from version 2 to 3, but provided a tool called transpec that would fix all the breaking changes for you in a one-time pass. What about safety? In software tools, safety means how easy it is to do the correct thing, or how hard it is to do the wrong thing or break your environment. Django's schema migrations is an example of ergonomic safety—it automatically adds foreign key constraints to your database (which, if you aren't familiar, is a simple and common way to ensure your database has correct data in it). Thinking back on the tools we've used, have any of them been particularly ergonomic? Even our most basic need for Webpack to compile two files doesn't work without specifying a lot of complex command-line parameters. When we introduced ES2015 to our tests, we lost source maps (not that they worked in PhantomJS in the first place). If you'll recall setting up CSS, the default behavior of using the css loader was to put all the CSS into a string which didn't get rendered anywhere. There are two approaches to making ergonomic, interoperable systems. The first is creating many single-purpose tools that have an open and common means of interoperating. I'll call this the “UNIX Way”, because this is how most UNIX systems are designed. The second approach is to have a tightly integrated monolithic system that sacrifices flexibility for ergonomics, providing a complete end-to-end experience for a complete use case. I'll call this the “Rails Way”, because Ruby on Rails popularized this approach (often called opinionated software). I hope it's obvious that Webpack and friends don't fit either of these categories. Neither provides an end-to-end solution, but neither is special purpose and focused enough to integrate into an arbitrary workflkow. Let's explore how we might solve our problems with tools designed around either of these approaches. The UNIX way is to have many small single-purpose tools that interoperate openly and transparently. For example, if you want to search a file for a string, you'd use grep. grep outputs lines that match a string. If you then want to extract data from those lines, you'd use cut or sed. What you wouldn't do is add a feature to grep that does this. And you definitely would not add a plugin system to grep, because it already has one via text. UNIX command-line tools' plugin system is text: each line is a record, and all tools operate on lines of text. The creator of sort did not have to think about how one might determine the most frequently-repeated line in a file; instead they just needed to allow sorting by numbers. cut and uniq can take care of the rest. Another simple means of interoperation is a file. We've seen this countless times in our journey, where we have source files that are processed to produce output files. This sort of pipeline has existed for decades. 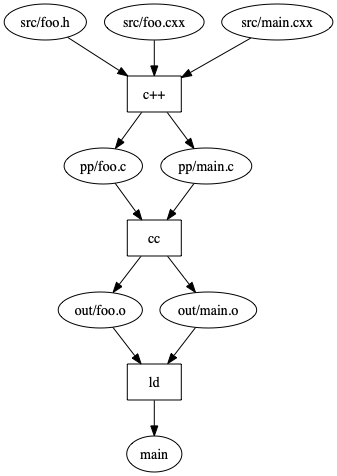 C compilers work this way, with each tool taking one format as input, and producing another as output. C source code is pre-processed to execute all the #if and #include statements. This processed source is compiled down to assembly, into what is called an object file. Several object files are then collected and linked together to produce a final executable. Each file output by one part of the pipeline feeds the next. The cc program didn't need a plugin system because it interoperated in a clean and transparent way. In fact, the designers of cc didn't have to be consulted in order to try out C++. What's more of a benefit to this approach is that each of these tools can be more easily maintained because they do fewer things. The maintainers of ld only need to be worry about taking in object files and producing an executable. It doesn't need to worry about the intricacies of the C language. Conversely, the compiler, cc doesn't have to worry about how to create executable files. Being separate applications means that integration points must be well-defined, forcing good design. 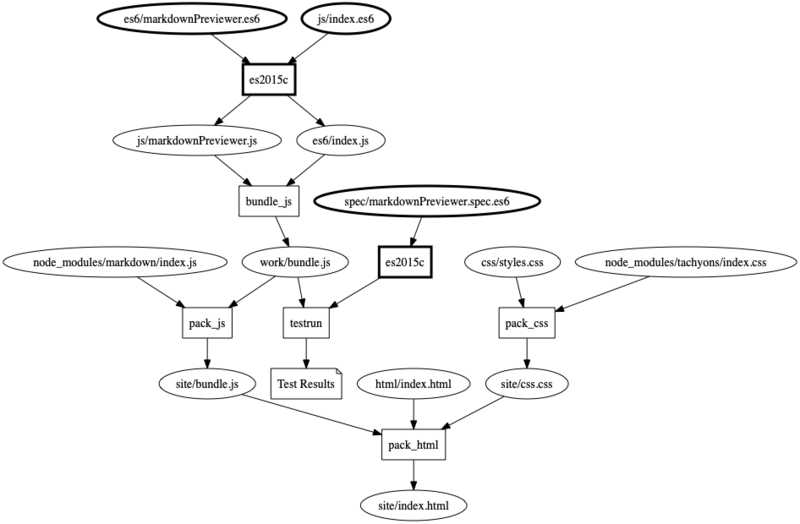 bundle_js takes JS code we've written, and follows local import statements to produce a file called the local bundle. This file still has imports for third party libraries. pack_html takes an HTML template as input, as well as a CSS and JS bundle, and produces a shippable .html files we can serve up. Notice how almost nothing downstream changed—we simply fed generated input to the toolchain from the output of another tool, and that tool's function is dead simple - turn ES2015 into vanilla JS. Notice again that we don't change that much. Notice that we can remove ES2015, and the entire downstream toolchain still works properly. You can start to imagine how we might extend this. Source Maps could be produced by another tool and consumed by pack_html. Minification could be added later in the toolchain. As a tool developer, this is much simpler - you take files as input, and produce files as output. The file types are your contract. The scope of any one tool is also small, meaning its easier to understand and maintain. You avoid all sorts of weird interactions because the contract between steps is well-defined and simple. As a developer, this is also much easier to understand. Each thing feeds the next in an obvious way. If one part of the toolchain is buggy, it's immediately obvious which one, and you have both an artifact given to it and the artifact it produced to share with the developers to figure out what went wrong—you don't have to put your entire project up on GitHub. There are other benefits to this approach. For example, there's no need to recompile CSS if JS has changed. There's no need to minify JS if just running tests. By smartly managing the dependencies, our build pipeline can be fast, but also transparent. Of course, you would need something to orchestrate this pipeline, but there are many many tools that do this already, including the venerable make. This additionally separates concerns by isolating small bits of functionality. The orchestration system only has to worry about orchestration and not what is being orchestrated. 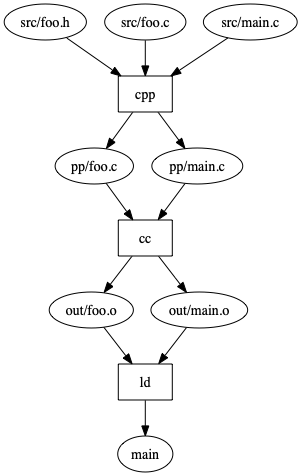 The main downside to the Unix Way is that you must cobble together your own toolchain every time (of course, this is how it is in JS-land already, but you don't get the benefits of small, self-contained tools). You also have to make a lot of uninteresting decisions, such as where files should go. The counter to this, which addresses this specific tradeoff, is to do the things The Rails Way. The Rails Way is to provide a tightly integrated, end-to-end solution that has little flexibility, but produces a highly ergonomic result. You don't have to (or get to) choose the location of files. You don't have to (or get to) decide what processes what. Anything you should do, you get for free and can't easily opt-out. For example, we discussed minifying and hash-ing files for production. In a Rails Way setup, that is configured for you and just happens. Webpack's -p is kinda like this, but still requires you to decide to use it. The more stuff is included and set up, the easier it is to get started. And because all of the parts are tightly integrated, they can capitalize on this. And, because the integrated system would choose your test framework for you, you just need to write your code. Suppose the system we set up worked this way? What would that look like? Because the framework is integrated, and not cobbling together existing tools (as most JS boilerplates do), it can be tested, designed, and evolved as one unit. No oddball interactions from disparate dev teams working on incompatible tools. Developers can go from 0 to running code in no time, with guarantees that everything works. You can immediately start writing code and don't have to make decisions about where files should go or what sort of configuration you need. Every project using this framework has the same shape, meaning you can jump into existing projects with a lot of context learned from the last one. Things learned from one project apply to the next. The downsides are flexibility. If the defaults that are set up don't work for your use-case, it's hard to change them. This also suffers the same problem as Webpack when there are internal failures—they are opaque and essentially impossible to debug. But, because the end-to-end system is designed together, by one team, this is less likely to happen. 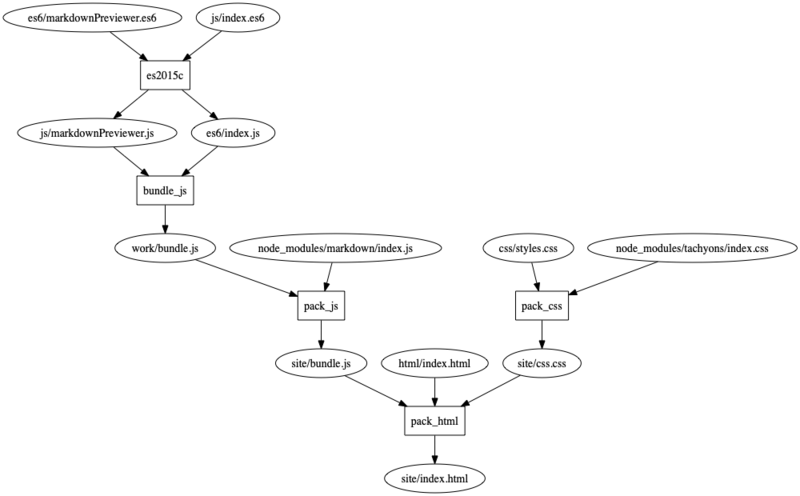 Webpack, Babel, etc. are all a hybrid of these two approaches. They have all of the downsides and few of the upsides. Each new project is a snowflake that must be hand-crafted. Each minor update to underlying libraries has a high chance of breaking things, because nothing was designed to interoperate in a good way, nor designed together. You also have a pretty high bar to getting a workable setup going—look how long it took us, and we aren't even using a front-end view framework like React or Angular. Trust me, it's even worse as you add those libraries. I believe the reason the JS ecosystem is like this is because it is an amalgam of many back-end ecosystem and framework cultures. Some developers believe very strongly in the UNIX way and eschew the Rails Way aggressively. Others are the opposite. There are many more in between, so no way of designing these tools will satisfy everyone, but everyone ends up in the JS ecosystem, because no matter what your back-end technology, you are very likely to need to serve up a web page. And that means CSS and JS. For me, the UNIX Way is the approach this ecosystem should take. The flexibility and maintainability allow the community to be agile with respect to workflows and best practices. It seems highly unlikely that any focused group or individual could create a universally applicable Rails Way of working with JS. The UNIX Way also satisfies all the boilerplate fans and would result in an ecosystem where many could contribute, and tools would be easy to understand. Take these lessons with you as you design software. If you aren't committed to developer or user ergonomics, if you aren't committed to making a fully integrated system that “just works”, design your system around small, single-function tools that have a clear means of interoperation. You can always bring them together, but you can never tear them apart. Before we say our final goodbyes, I want to share some thoughts around adopting Webpack on your project, given that we aren't going to see some of the solutions I outlined above.